"International media on Thursday claimed that Saudi Crown Price Muhammad Bin Salman has gone missing since April 21 attack on the royal palace in Riyadh. It is believed that he had been injured in the attack and shifted to an undisclosed location by his guards. For almost one month, where is he, no one knows it officially, as reported by Russian and Iranian media. As Press TV points out, the official Saudi websites have not released any new photo of bin Salman for several past weeks. The crown prince was allegedly hit by two bullets during the attack. According to local media reports, bin Salman was evacuated to a nearby bunker at a military base for his safety. bin Salman’s long disappearance has raised speculation about his health. However, no official statement regarding the disappearance came from Saudi Arabia. Some sources claimed that attack on the royal palace was part of a coup led by Saudi royals who are opposed to King Salman, while Saudi authorities had rejected the claim saying that the incident merely involved palace security guards firing upon a drone which allegedly was flying too close to the premises"
Saudi authorities should also provide information about a Saudi prince, Nawaf Talal Rasheed, reported to be missing since being deported from Kuwait on May 12 and to make clear if was arrested and on what grounds, she said. Pretty poor picture with the article? "While speculation is ripe that Crown Prince of Saudi Mohammed Bin Salman is dead as he is not active on social media of late. 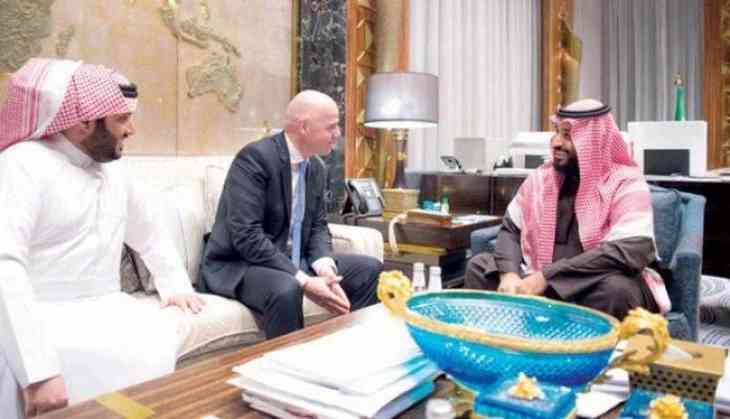 He met the President of the International Football Association (FIFA) Gianni Infantino on Friday. Prince Salman wasn't seen after April 21 when a heavy gunfire echoed near the royal palace in Riyadh. State news agency claimed that gunfire was to topple King Salman"
Rasheed goes missing after this alleged incident at the royal palace in Riyadh? The incident at the palace is the reason for the bin Salman is dead rumours. Recall November 2017, Bin Salman had conducted mass round ups of persons opposed to him? LONDON — A midnight blitz of arrests ordered by the crown prince of Saudi Arabia over the weekend has ensnared dozens of its most influential figures, including 11 of his royal cousins, in what by Sunday appeared to be the most sweeping transformation in the kingdom’s governance for more than eight decades. The arrests, ordered by Crown Prince Mohammed bin Salman without formal charges or any legal process, were presented as a crackdown on corruption. It seems something is going on in Saudi Arabia. That guy's no good dead or alive. ;-] But I do see your point. He should put up or lie down and stay down. This will please you: Roseanne Barr's show has been kicked offline and she's closed her Twitter as well. She made some anti-Muslim slurs and that was the last straw for some people. Now she can make aliyah and got to war with whoever Israel hits next.